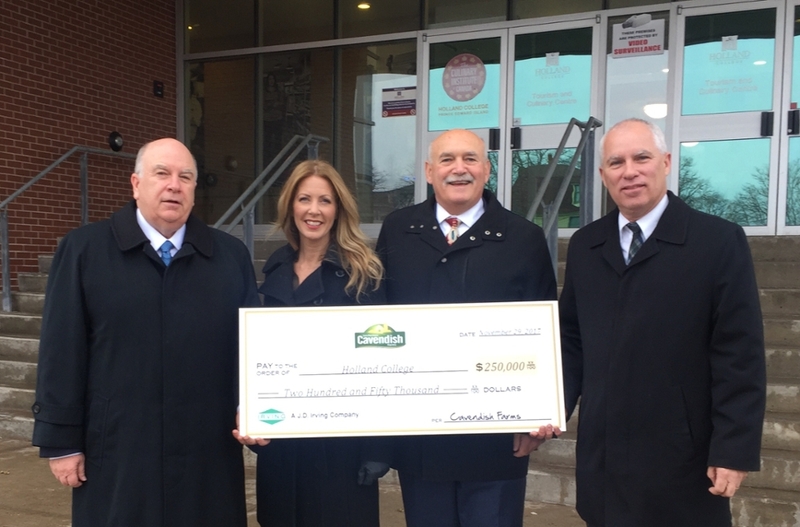 Long-time Holland College supporter Cavendish Farms recently made a $250,000 gift to Nourish, a capital campaign to enrich The Culinary Institute of Canada. This gift augmented a $1 million commitment that Cavendish Farms had previously pledged to the effort. The Nourish campaign, led by the Holland College Foundation, is part of a $7.5 million renovation and expansion taking place at the Tourism and Culinary Centre. $5.1 million was provided through a federal-provincial investment, with $2.4 million raised by the Holland College Foundation. Inclusive in the $7.5 million objective is a $500,000 contribution to financial aid for students entering programs at The Culinary Institute of Canada. Cavendish Farms has been a supporter of Holland College since 2008, when they invested $1 million to help establish Canada’s Smartest Kitchen, a food product development facility at The Culinary Institute of Canada. Cavendish Farms is a family-owned company that produces quality frozen and fresh potato and appetizer products for the North American and international food industry. They operate six processing plants including three on Prince Edward Island. In addition to the contribution by Cavendish Farms, President Robert K. Irving made a personal gift of $50,000 to the Nourish Campaign. Mr. Irving has also been a steady supporter of Holland College, having co-chaired the College’s Learning. For Life. Campaign alongside Ray Murphy in 2009. Dr. Brian McMillan, President of Holland College, lauded Cavendish Farms for recognizing the importance of this strategic initiative. The Culinary Institute of Canada re-opened in November 2017, and is making plans for a grand opening in early 2018. For more information about the Nourish Campaign, visit hollandcollege.com.